Albany, NY - September 28, 2014 - Governor Andrew M. Cuomo is in Afghanistan today with a bi-partisan delegation of governors at the invitation of the U.S. Department of Defense, which is sponsoring the visit. Today, Governor Cuomo received a series of security briefings from U.S. Department of Defense, U.S. Department of State, and other federal officials. Governor Cuomo also visited Bagram Airfield to tour its operations and thank New York and other American troops for their service – including those from Fort Drum, NY’s 10th Mountain Division. Upon his arrival at Bagram Airfield, Governor Cuomo was met by Major General Stephen J. Townsend, the commander of Regional Command East (RC-E) and Fort Drum’s 10th Mountain Division. RC-E is headquartered at Bagram Airfield. Earlier this year, Fort Drum’s 10th Mountain Division assumed command of Regional Command East in Afghanistan. According to the International Security Assistance Force (ISAF), RC-East includes the provinces of Bamyan, Ghazni, Kapisa, Khost, Kunar, Laghman, Logar, Nangarhar, Nuristan, Paktika, Paktiya, Panjshayr, Parwan and Wardak. It covers 46,000 square miles, approximately the size of Virginia, and shares a portion of the border with Pakistan. Approximately 270 members of the New York National Guard are currently deployed in Afghanistan – the bulk of which are based in the Hudson Valley and New York City. Additionally, approximately 900 members of Fort Drum’s 10th Mountain Division are stationed in Afghanistan. Governor Cuomo is joined as part of the bipartisan delegation to Afghanistan by Under Secretary of the Army Brad Carson, Governor William E. Haslam (Tennessee), Governor Jeremiah W. Nixon (Missouri), Governor Brian E. Sandoval (Nevada), and other Department of Defense officials. During the trip, Governor Cuomo is receiving a series of briefings from senior U.S. officials on counterterrorism issues, the evolving global threats that affect New York’s security at home, and other matters. Governor Cuomo was invited to visit Afghanistan by Secretary of Defense Chuck Hagel. Due to security issues, the trip could not be disclosed publicly in advance. On Friday evening, September 26, Governor Cuomo arrived in Washington, DC from New York. That evening, he received security briefings from U.S. Department of Defense officials before departing from Andrews Air Force Base and traveling to Ramstein Air Base in Germany en route to Afghanistan. Governor Cuomo arrived in Germany on Saturday, September 27. While in Germany, Governor Cuomo visited Landstuhl Regional Medical Center, where he met with hospital staff and wounded servicemembers. (Photos of Governor Cuomo's visit to Landstuhl Regional Medical Center are available here.) Governor Cuomo then traveled from Ramstein Air Base to Afghanistan – arriving in Afghanistan Saturday evening local time (Afghanistan is 8:30 hours ahead of New York time). Thank you all very much for taking the time to join, and Melissa thank you for setting up the call. It’s been a really educating and fascinating couple of few days. I left on Friday from New York. We couldn’t give prior notice of the trip because the Department of Defense, which set up the trip, wanted it kept secret until we were on the ground for security reasons. But I left from New York and went to Andrews Air Force Base first from a number of federal agencies that were on basically Middle East issues, terrorism specifically and Afghanistan, because this is a historic moment for Afghanistan. There is going to be, hopefully, an inauguration tomorrow of the new president and then a bilateral security agreement signed with the United States which allows a presence to remain in a model of cooperative assistance. But we had a number of briefings, we spent a few hours at Andrews Air Force Base, and flew to Germany where we stopped at the Ramstein Air Base and visited the main hospital, which is used for the region for soldiers who need serious care, they come to this hospital. Luckily the numbers were way down, evidencing fewer casualties as we know because of the steps the country is taking. But I had a chance to chat with a couple of these young soldiers, and I tell you they were inspirational. One young fellow who has a broken leg and plate screws in his leg, all he wants to talk about is how he wants to get back to his unit. He has a choice of rehabbing in the hospital or going back to the unit immediately and he wants to go back to the unit. One young fellow who is bleeding internally – they can’t figure out why he’s bleeding internally – literally tears up as he’s telling the story. And why does he tear up? Because he feels that he’s let his buddies down by leaving them on their own. It was really amazing. The troops that I’ve met since – the 10th Mountain Division, which is out of Fort Drum, has a major presence here. And the Mountain Division has a proud history and has had hundreds and hundreds of soldiers come through deployment. The numbers were really staggering. We also have a number of National Guard and its interesting because I spent so much time with the National Guard, I recognized many of them because they had done Hurricane Sandy, Flood Irene, Storm Lee, and so I literally have seen many faces that I’ve seen throughout – a lot of them work on Empire Shield, which is also our homeland security piece. But that’s been great and they really appreciate taking the time to visit with them and letting them know that people care and respect their service. I spent the most time at the Kabul base – the most time in classified briefings from the Department of State, USAID, DOD obviously – with generals who have decades of experience in the Middle East, talking about terrorism and what’s happening with terrorism, why what seems like a sudden growth spurt in terrorism and how do we handle it and what do we do differently. Because Afghanistan in some ways poses what we believed was the problem. 9/11 happens, it’s Al Qaeda, we’re going to get Al Qaeda and it takes us to Afghanistan and in Afghanistan we basically have done what we set out to do. Certainly not perfectly, but we’ve made real progress in Afghanistan. There was an election – not the neatest election ever held, but there was an election that wound up with eventually a power-sharing agreement – an inauguration that is supposed to happen tomorrow. We said we were going to diminish Al Qaeda and we did. We said we were going to diminish the Taliban and we did. We said we were going to help develop Afghanistan and we did. The numbers on Afghanistan’s growth were starting at a very low point, but the growth is really extraordinary. The number of people who are educated, the number of women who are educated, child mortality rates – I mean there is success all across the board. So in some ways if you look at Afghanistan and the way we define the problem you could say we accomplished what we set out to accomplish. But along the way, the problem changed. And it’s not just Al Qaeda and the Taliban. It has now metastasized over the past 13 years. You can have a fascinating discussion about when did ISIL become ISIL and did it really develop overnight and had it been developing over a couple of years, but everyone will say this is a virulent strain of terrorist activity and culture – and it’s a competitor of Al Qaeda. So now the situation and the definition of the problem become more complex. And it’s not just Afghanistan and Pakistan and Syria. It’s now a Middle East-wide problem. And there are off-shoots of different terrorist branches and sometimes they’re in competition with each other. So the problem – we want to solve one problem and now we have eight different problems. And my point as the Governor of New York – New York is at the top of everybody’s threat lists. And we have spent a lot of time and we will spend a lot of time on homeland security and defending New York at our ports, at our rails, etc. And my goal is to have the most sophisticated homeland defense system ever designed by any state, period. That’s my goal. But, if you want to handle this problem it’s going to have to be done on two prongs, with two prongs. One is homeland security, and second you have to get to the Middle East. You have to do something about stopping the development of the problem. It can’t be that our answer is going to be we’ll always catch it before it comes in the airport. We have to do something about resolving, managing and controlling the source of the growth of these terrorist cells. Because at this rate of growth it’s going to be very hard to manage. And people say ‘do you think it’s going to get better or worse?’ – maybe it gets a little better, maybe it gets a little worse, but what I believe is it doesn’t go away, and I believe this is a generational problem. And for me, as a Governor who likes to believe he’s had experience and knowledge in the matters that he’s responsible for, this is a topic that goes to the top of my list of not just a good solution, but educating myself, educating the people in the state about what this is really about and what it’s going to take. And that’s what the trip has been all about for me. Audio of the Governor’s briefing with reporters is available here. Photos of the Governor’s visit are available here. 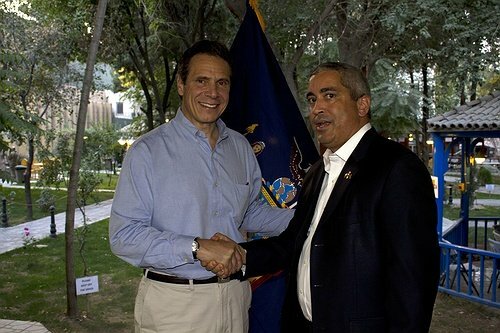 Images by Governor Cuomo on Flickr. Subject: LongIsland.com - Your Name sent you Article details of "Governor Cuomo Receives Security Briefings, Meets With New York Troops in Afghanistan"